Raumfahrt - ISS-ALLtag: Japanese Cargo Ship Departs Space Station. Next Stop: Oblivion. Astronomie - E.T., we’re home Existing laser technology could be fashioned into Earth’s “porch light” to attract alien astronomers, study finds. Raumfahrt - SpaceXs Starman Roadster has ventured past Mars Dont expect it to come back home for a while. When China built the world’s largest telescope, officials said it would make the country the global leader in radio astronomy. The problem is, they can’t find enough people to run it. 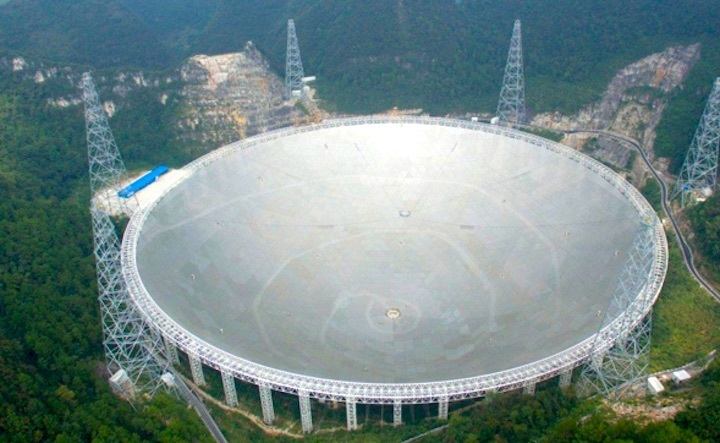 Officials are struggling to find researchers to analyse the signals the US$180 million FAST radio telescope in southwest China’s mountainous Guizhou province is expected to detect from sources across the universe when it officially launches sometime in the first half of 2019. The plan had been to hire another two dozen researchers after the launch, according to job postings late last year on the website of the instrument’s owner, National Astronomical Observatories. But Zhang Shuxin, director of FAST, told the state-run newspaper Science and Technology Daily on Sunday that “so far we have only hired half of the researchers we need”. The job posting was republished on the National Astronomical Observatories website on Monday. The hiring scramble highlights the challenges faced by China’s scientific research community in attracting and keeping talent. Surmounting this obstacle is seen as critical if China is to achieve its goal of becoming an innovation leader by 2050. For job candidates, the major stumbling blocks often are financial incentives and research independence, researchers told the South China Morning Post. The telescope’s remote location also may give candidates pause. George Smoot, a Hong Kong University of Science and Technology professor who won the Nobel Prize in physics in 2006, said candidates interested in working in a more developed setting might think twice about spending a lot of time in an area known for its traditional rural villages. “Another issue is how much the Chinese Academy of Sciences will influence and direct activities there,” Smoot said. FAST (an acronym for the 500-metre Aperture Spherical Telescope) is a giant dish hidden in the remote mountains of Guizhou, which has some of the nation’s largest karst caves and limestone hills. These form depressions that naturally fit the shape of the dish – making it the ideal terrain for a giant telescope. Dubbed “Sky Eye”, the project was first outlined in 1994 by the late Chinese astronomer Nan Rendong, who also served as its chief scientist before his death last year. The telescope has discovered and identified 53 pulsars – a type of star – since it started tests in 2016, suggesting a high level of sensitivity. According to Jiang, there are around 20 full time researchers currently on site. Astronomers interested in joining the team should speak fluent English and expect to work in the remote location on a long-term basis, according to the job postings. The compensation package totals around 100,000 yuan (US$14,400) per year. “It’s not surprising they have had difficulties hiring people, given the low pay compared with similar international institutes,” said a chemical physics researcher with the Chinese Academy of Sciences, who asked not to be identified. Smoot said the lack of suitably qualified researchers within China was another contributing factor to the project’s recruitment difficulties. “There are not so many people in China with radio observatory and science experience, particularly in observations, which means it is a smaller pool to recruit from,” he said. The project has also been searching for a chief scientist, with a pay package of US$1.2 million, since late 2017. The post is open to qualified astronomers from any country but so far no results of the search have been announced.